Snake Charming is an ancient practise that dates back thousands of years. 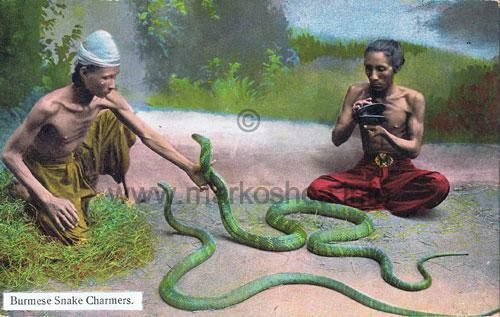 It is primarily a practise carried out in North Africa, the Middle East and Asia yet despite there being plenty of suitable cobras in sub-Saharan (black) Africa, the practise does not seem to have migrated down from the north, although witch doctors, sangormas and other medicine men use snakes in their rituals. Some charmers care for their snakes, others use brutal methods to prevent a bite, such as pulling fangs or sewing up the snake's mouth. As with everything, there are the good guys and the bad guys. Some snake charmers have even taken to using non-venomous snakes to avoid an almost certainly fatal snakebite. Yet these guys still manage to charm money out of gullible tourists. 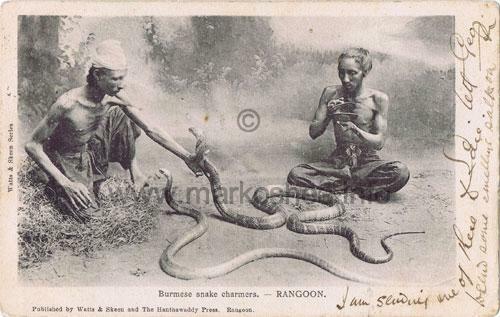 I have assembled a collection of images of snake charmers that date back over 100 years and plan to post some of them on these pages as time permits, for the time being, one of my favourite snake charmer postcards, two Burmese snake charmers with a pair of attractive king cobras (Ophiophagus hannah). 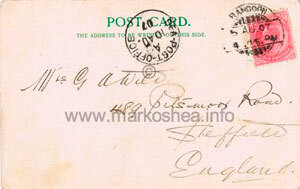 It is likely that this postcard was artificially coloured during production. "....department, but these have riders here so we took them for this year. When the rains first began we had a great time with leaking roofs but got 20 carpenters busy and we are all right now. Goodbye for this time. I hope you are feeling better now the warm weather has come. It seems so strange to think of any one being cold or having a fire to keep warm by. Much love, Lillian"
The sepia version is below. The card was addressed to Mrs G. A. Wild, 489 Pitsmoor Road, Sheffield, England. This address still exists with the postcode S3 9AT but it appears to be boarded up next to an off-licence (Google Maps). "I am sending one of these to Edie, do send some smelling salts on. Love Geo. 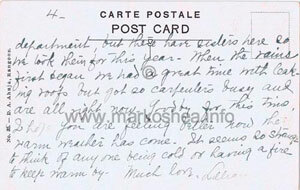 L."
A clear reference to the fact that the intended recipent of an identical postcard, whose name seems to be Edie, short for Edith, was not a snake lover!